Nestled in the historic neighborhood of Beacon Hill, 75 Chestnut provides regional American comfort food served in a truly captivating setting. 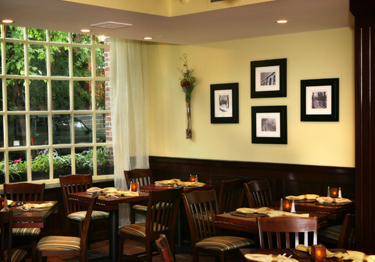 The restaurant's bistro-like interior provides a cozy and friendly ambiance. 75 Chestnut is the place to pop in to have a drink or a bite to eat, catch the game, meet some friends, and have some fun and good times. "...with all the dark, polished wood, the bronze-hued light warming the room, and the lantern-lit rows of Beacon Hill brownstones forming the backdrop outside, it just feels good to hang out here. "It still seems like your own little secret, this subtly signed, discreetly placed little spot located just steps from the bustle of Charles Street. Its unexpected presence on semi-residential Chestnut, with an austere black awning framed by a pair of paned bowfront windows, feels like something that slipped in and took root at the dawn of time, before draconian zoning laws could have excluded it. This is not a place that one just spots and happens to saunter in; you must stride purposefully off Charles Street, past the intriguing antique shops, and be looking for the entrance."